Counting on Pedestrian Telepathy is Bold. Maybe Too Bold. 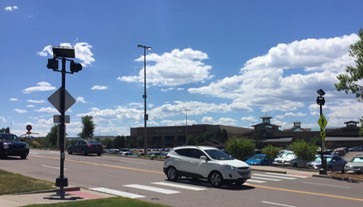 A few months ago, I had gone shopping at the mall, and then decided to cross the street for a little lunch without moving my car. It seemed like a reasonable thing to do, especially given that you’d provided this handy dandy crosswalk. The crosswalk itself is . . . bold. Very bold. 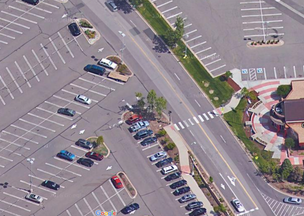 Below is a closeup of the crosswalk. When you’re a pedestrian, you come up to the pole, and push a button. This apparently triggers the lights, which are DIRECTLY ABOVE YOU to flash. You can’t see them flashing, and there’s nothing pointed at you-the-pedestrian to indicate when they start and stop. You’ve got the red bumpy surface on the slope down to the crosswalk, which is very blind-person friendly of you. BUT you don’t have the sound to indicate when the light is flashing at the cars, so that is not so blind-person friendly. And it doesn’t help those of us who are figuratively blind because we have absolutely no idea when it’s safe to cross. This is all made more exciting because - as you can see in the top photo - the crosswalk is really near an entrance to the mall road, so people are coming fairly quickly around the corner and don’t have good visibility before they need to slow down. So here I am, a pedestrian who has pushed a button to trigger the flash of a light I cannot see which will presumably stop the cars which can’t see me. My best bet seems to be to telepathically scream STOP while frantically crossing. You can see, dearest Park Meadows, why entering this crosswalk is more of an act of faith than the average tired and hungry shopper might want to take on. Please consider the non-telepathic pedestrian in future designs.